After a couple of false starts, the back-to-basics lighter, funnier Flash (Flash Light?) finds its footing in an episode that’s pretty much a delight from start to finish. Barry Allen isn’t annoying, Harry Wells returns for some vintage Cisco bantering, and the villain (who isn’t especially villainous) has powers that are deployed in fresh, clever fashion. While not completely devoid of head-scratching moments, “Luck Be A Lady” demonstrates that showrunner Todd Helbing and company recognize the flaws that had developed over the course of the series and are determined to correct them. Whether the tone established in this episode is sustainable over a full season remains to be seen. Some darkness is bound to creep back in as the Thinker arc grows more prominent, but for now the big bad mostly serves as a framing device—an observer (along with his partner, the Mechanic) of the twelve newly created metas who may be able to help him implement his plan, whatever that turns out to be. The second of those metas to be revealed is Hazard, the formerly unlucky Rebecca Sharpe (a winning comic turn by Sugar Lyn Beard). After catching her boyfriend in flagrante delicto, enduring sexual harassment at her casino job, and being fired for spilling a drink on a guest, Sharpe’s luck changes when she’s hit with a wave of dark matter. Now she generates a good luck field around herself that redirects the bad variety to those around her. That wave of dark matter hit Sharpe and eleven other passengers on a city bus when the Speed Force ripped open to eject Barry in the season premiere. That’s right, once again IT’S ALL BARRY’S FAULT...except this time it really isn’t, since he had nothing to do with that plan. For once, it’s the rest of Team Flash who can shoulder the blame, and Barry has the good manners not to be smug about it. The team could use an assist to deal with this latest disaster, and it arrives in the form of Harry Wells, the one we already know from Earth-2. The purpose of Harry’s visit is ostensibly to deliver a “breakup cube” to Wally so Jesse can end their relationship via hologram, but as it turns out, he’s been kicked off his own Earth’s equivalent of Team Flash (Team Quick or perhaps “Jesse and the Quicksters”). Since Earth-1's team is down one Harrison Wells following HR’s untimely demise, it makes sense for him to stay. This can only be a good thing, and although Tom Cavanagh’s performance feels a little off in his first couple of scenes (as if he had to shake off some residual HR before fully inhabiting Harry), by the end, he and Cisco are bickering like they haven’t missed a beat. Harry’s decision to stay on Earth-1 may mean season four will be the first without a new incarnation of the character, but I doubt it; even if it’s only for an episode or two, my bet is there’s another Wells on the horizon. With one arrival comes another departure, as the revolving door on STAR Labs keeps spinning. This time it’s Wally, freshly dumped and missing in action for most of the episode—something that goes unnoticed by the rest of the team. He decides he’s got to move on and find his own path, a turn of events that feels a bit abrupt, as if the writers suddenly decided one speedster is enough after going overboard with the fleet of foot last season. It makes perfect sense, however, if Kid Flash is transferring over to Legends of Tomorrow, something that has been speculated about but (as far as I can tell) not confirmed at this time. That would get the character out of Barry’s shadow and avoid a duplication of duties, while keeping him firmly in the CW-verse for crossovers and other guest appearances. Stay tuned. In any case, there’s no room for Wally’s moping here, because this is the revamped Happy Fun Time Flash Show! And it works remarkably well this week, largely thanks to the quantum entanglement of bad luck that manifests in all sorts of entertaining ways, encompassing both simple visual gags (the Flash slipping on marbles, the water pipes bursting in the West house) and Rube Goldberg-ian setups (one involving an espresso machine, a nail gun, and a baby is mercifully derailed by Hazard’s departure from Jitters). I enjoyed it so much, it didn’t even bother me that much when Team Flash’s solution to the problem failed to pass the smell test. (If another blast from the particle accelerator temporarily shorts out Hazard’s powers, wouldn’t it do the same to every other meta in the vicinity, Barry included?) 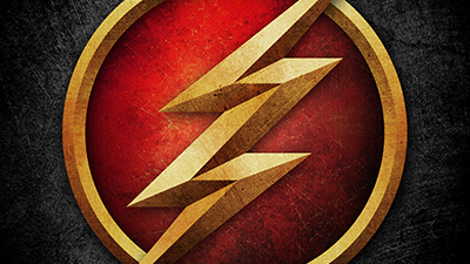 It would be premature to declare The Flash’s makeover a success, but for now at least it’s on the right track. It’s been a while since the show reminded us that Barry needs to eat a ton of food to keep his super-speed metabolism going, but here he loads up on burgers and churros after a round of laser tag. A subtle touch I enjoyed: Unlucky Rebecca can’t get her name spelled right on her Jitters cup, but it’s no problem for Hazard. Cecile announces that she’s pregnant, which will either complicate the West family tree even more or mark her for death. Next week’s episode, “Elongated Journey Into Night,” brings us the (e)long(ated)-awaited arrival of Ralph Dibney.